Cradled in a valley between the Rocky Mountains, the Monashee Mountains and the Cariboo Mountains, the friendly village of Valemount is itself nestled at the foot of Canoe Mountain. Valemount is the home of Mount Robson, at 3,954 metres the highest peak in the Rockies and the origin of the mighty Fraser River. This is real mountain country, with unparalleled natural beauty, quiet solitude, and clean mountain air in The Valley of the Mountains. Valemount offers some amazing snowmobiling and heli-skiing in winter, and hiking, camping, and trail riding are popular during the summer months. A true valley for all seasons. The history of Valemount dates back to the arrival of the first European fur traders David Thompson and Pierre Hatsination around 1805. The Overlanders passed through the area in 1862, en route from Ontario to the Cariboo Goldfields. The Great Northern and Grand Trunk Railroads came into the area about 1910, with railroad activities centred around Tete Jaune Cache, 25 kilometres to the north. 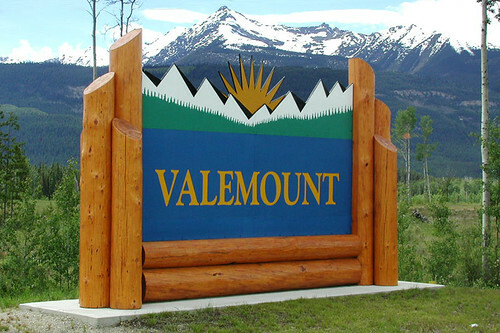 Valemount became a railway station in 1928, and expanded gradually until the 1960s with the development of improved highways. 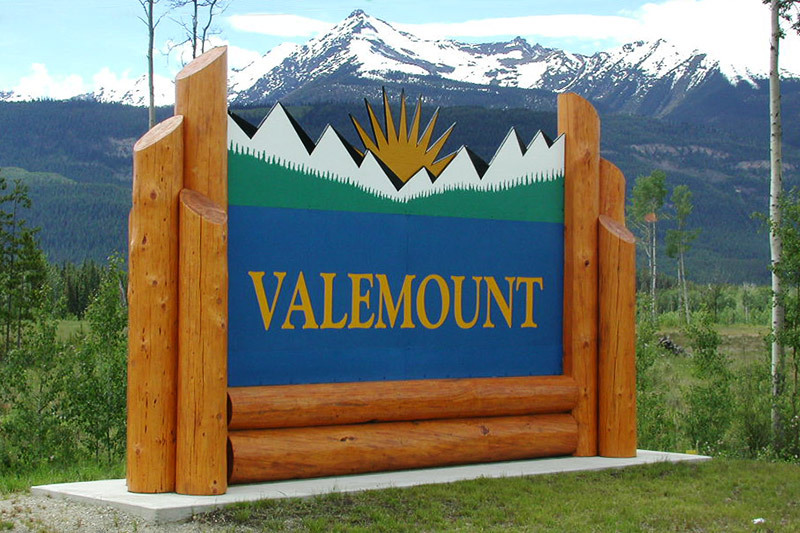 The economy of Valemount today is based on forestry, ranching, and a very strong tourism industry. Location: Valemount is located on the Yellowhead Highway 5, near the northern tip of Kinbasket Lake, 14 miles (22 km) south of Tete Jaune Cache and 200 miles (320 km) north of Kamloops. Although outdoor activities dominate in Valemount, be sure to check out local history at the Valemount and Area Museum, which showcases the unique homesteading lifestyle of early settlers, and the history of the railroad. Displays include a restored 1914 Railway Station, Caboose, antiques, artifacts, pioneer cabins, and heritage buildings. View the miracle of the salmon life cycle at the George Hicks Regional Park. Every August, Chinook salmon return virtually the entire length of the Fraser River to complete their migration and spawn in Swift Creek. This is a true miracle of nature, and should not be missed. BC Wildlife Watch viewing sites, complete with observation towers, are located in the park. A stop at Robert W. Starratt Wildlife Sanctuary, a Ducks Unlimited project at the edge of town, leads to trails and walkways that provide easy access to observation towers where the rich wildlife and birdlife of the wetlands can be observed. Two attractive BC Wildlife Watch viewing sites, complete with observation Towers, are located in the park, connected by an existing trail across a dike, and a second walking trail to Cranberry Marsh is under development. Mount Robson Provincial Park: The peak of Mount Robson is the highest in the Canadian Rockies, towering 12,972 feet (3954 m) over the western entrance to the park. Mount Robson Provincial Park, one of the oldest parks in British Columbia, contains the headwaters of the Fraser River, and, in the northwest section of the park, the massive Berg Glacier, notable for being one of the few living (or advancing) glaciers in the Canadian Rockies. 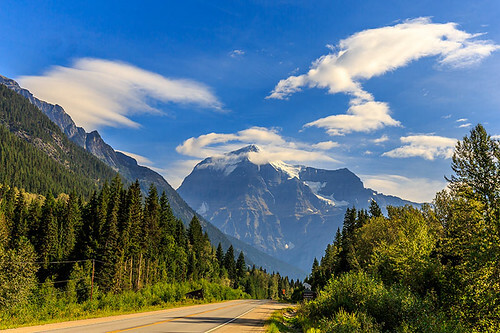 To really experience Mount Robson Provincial Park you need to get out of your vehicle and hike, as the superb scenery in the park makes it an excellent site for hikers, climbers, and backcountry enthusiasts. The park contains 202 km of hiking trails ranging from easy strolls to challenging backcountry excursions. Rearguard Falls and Overlander Falls are short walks, while the Mount Fitzwilliam Trail and the spectacular Berg Lake Trail, which starts in a Cedar Rain Forest and meanders through the Valley of a Thousand Falls, offer wilderness camping opportunities. There are three camping areas in the park: Robson Meadows Campground and Robson River Campground, both near the western boundary, and Lucerne Campground, just west of the Alberta border. Wilderness campsites are also located along the Berg Lake Trail. Concrete boat launches and ample parking are located at the east end of Moose Lake and at Yellowhead Lake; the latter also has a sandy beach. Take Hwy 16 east from its junction with Hwy 5 in Tete Jaune Cache into the park, which is adjacent to the Alberta border and Jasper National Park. Wildlife abounds in the Valemount area. Elk roam the eastern region of Mount Robson Park, near the Lucerne Campground, moose can be seen in the marshes at the east end of Moose Lake, while mountain goats and grizzly bear frequent the rock slides on the north side of the highway and Yellowhead Lake. Caribou range the high basins and tablelands, with mule deer and black bear being found throughout the park. Smaller animals such as pika and marmot may be observed on rocky terrain, and squirrels and chipmunks scamper at lower elevations. Beaver and muskrat inhabit the marshlands. British Columbia is one of the richest wildlife viewing areas in Canada. 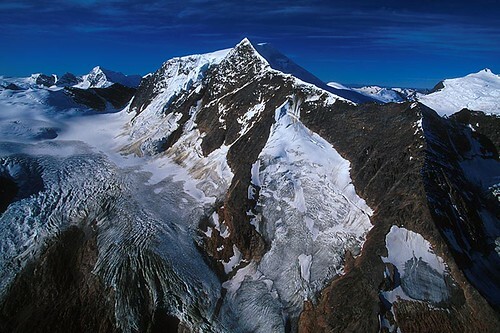 Helicopter Tours offer a unique opportunity to see the valley from the air. Take a panoramic aerial tour of magnificent Mount Robson and Mount Terry Fox, or fly over glaciers with their yawning crevasses of ancient ice. Mount Terry Fox Provincial Park: A challenging 13-km round-trip hike in Mount Terry Fox Provincial Park leads into the alpine zone from its trailhead north of Valemount. Staggeringly impressive views are everywhere along this route. Mount Terry Fox is located 10 km north of Valemount off Hwy 5. Rearguard Falls Provincial Park: You can fish at Rearguard Falls Provincial Park, approximately 5 km east of Tete Jaune Cache on Hwy 16. The park is on the Upper Fraser River, and the falls are the final barrier to salmon migrating from the Fraser’s mouth, some 744 miles (1,200 km) southeast at the Pacific Ocean. Salmon season begins in August and continues through September. Golf: Golfers can tee off at the Valemount Pine Golf & Country Club, a 9-hole semi-private golf course situated on a plateau with wonderful mountain views, or the Melsview Links Golf Club, a public 9-hole course located 1km South of Valemount on Highway 5. Golf Vacations in British Columbia. Canoeing & Kayaking: Canoeists can paddle the McLennan and Fraser Rivers, or canoe through the R.W. Starratt Wildlife sanctuary for a close-up view of the migratory bird, mammal, amphibian and plant life in the sanctuary. Guided tours are available. To canoe the long and skinny Kinbasket Lake, start at Canoe Reach at Valemount (near the north end of the lake, just south of Tete Jaune Cache on Hwy 5) and work your way south. There’s a boat launch beside Hwy 16 in Mount Robson Provincial Park that provides access to Moose Lake and Yellowhead Lake in the park. Kinbasket Lake offers superb fishing for trout, kokanee and dolly varden. Camping: Valemount has a number of private campgrounds, including Irvins RV Park and Campground, and Valemount Campground beside Swift Creek. Five other campgrounds range in size from 6 to 30 sites; Outpost Campground, Summit River Lodge and Campground, Tete Jaune Campground, Valemount Pines Golf Course and Campground, and Wilderness Creek Campground. Horseback Riding: The mountainous area around Valemount is a perfect place for guided horseback riding trips to happen. See the Robson Valley from high upon a ridge, on the back of a well trained horse – suitable for riders of all ages and levels of experience. Winter Activities: Valemount is the hub of the Cariboo, Monashee, and Rocky Mountains, and is the best base you can have for your heli-skiing and snowmobiling adventure. These mountains provide an ideal variety of snowmobiling terrain, including scenic logging roads, high plateaus, and steep mountain trails. Riding through deep powder snow above the tree line with a view forever is a thrill beyond compare. Clemina Creek, Allen Creek and Miledge Creek all have marked and groomed trails, with day cabins on or near the alpine at Clemina Creek and Allen Creek. Snowmobile tours are available. Whitewater Rafting: Embark on an exciting half-day whitewater rafting adventure on the mighty Thompson River, the longest and most historic river in British Columbia. You can also choose a gentle floating trip down the scenic Thompson, with magnificent views of Mount Robson, and good wildlife viewing opportunities. Although it’s entirely possible to run the river unaccompanied, the majority of paddlers opt for the services of a certified guide, at least the first time. Whitewater Rafting in the Thompson Okanagan. Backcountry Offroading: You know you can reach the mountain ridges of Valemount by horseback, hiking, snowmobile or by helicopter. No prize so far, but have you considered a backcountry adventure by ATV? Tour alone or with friends, an exciting challenge for all. Some of the expeditions take you to over 3,000 metres above sea level, to summits that reveal many breathtaking panoramas. Fishing in Mount Robson Provincial Park is generally poor because of the cold temperature of the waters and their high sediment load, but Yellowhead and Moose Lakes support populations of dolly varden and lake char, and kokanee and rainbow trout. To simply observe the fish, go to the west side of the park, where a lookout gives a view of Rearguard Falls, the furthest migration point possible on the Fraser for most returning Pacific salmon. Winter Festival: Events at the Valemount Winter Festival at the end of January include a winter triathlon (skate, cross-country ski, run), milk-jug curling, dogsled rides, and the little-known sport of body bowling, which involves participants being hurled across a frozen lake in the hope of knocking down a set of oversized pins. 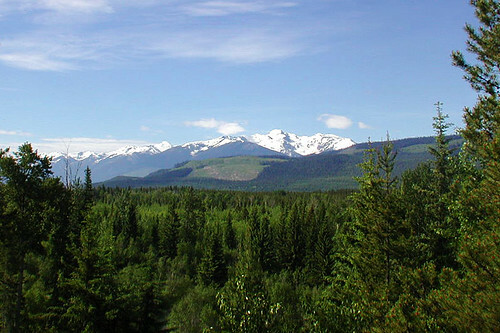 Visit nearby Tete Jaune Cache, 25 kilometres north of Valemount. In the past, the town was strategically placed at the head of navigable waters of the Fraser River, and played an important role in the construction of the two great railway systems, now merged as Canadian National. Although most of the original townsite is gone, all of the colourful history remains. South of Valemount is Blue River, set in an untouched natural valley. The winter sports paradise of Blue River lies in one of the world’s most productive snow belts for high-quality, reliable powder snow, with the Cariboo Mountains to the north, the northern reaches of the North Thompson River to the east, and Wells Gray Provincial Park to the west.